One of the recessed LED lights installed in our access ceiling. 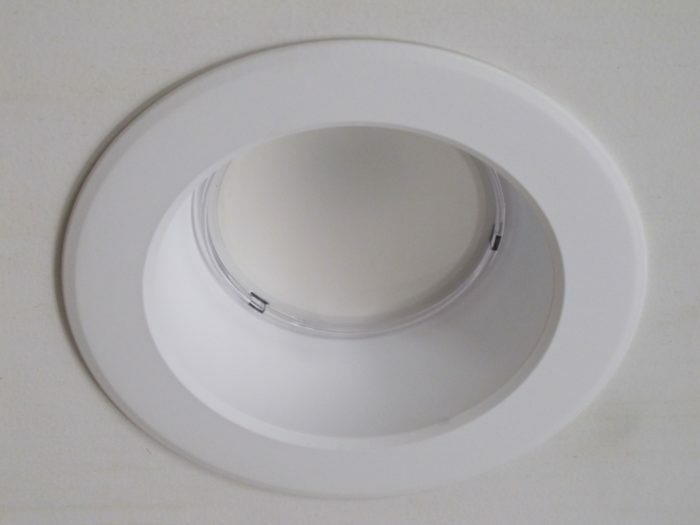 One of the recessed LED lights installed in our access ceiling. This recessed LED light is the CR6 from Cree. Image Credit: Alex Wilson The Cree CR6 lamps we've installed screw into a standard Edison base that also accepts incandescent bulbs. 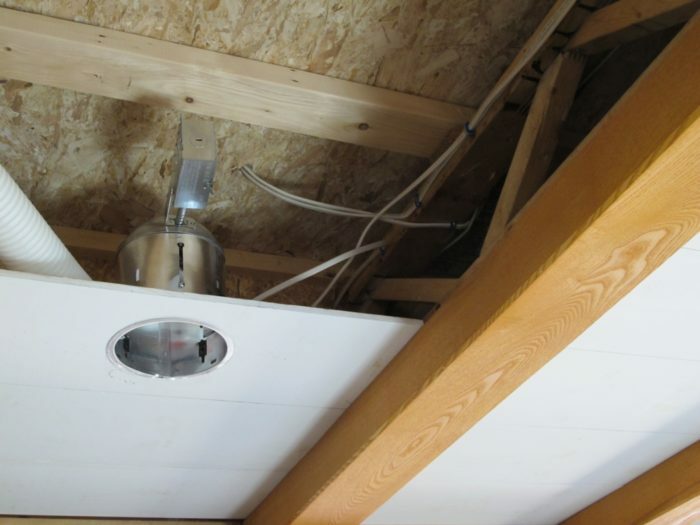 Image Credit: Cree Peeking into the access ceiling where the recessed cans are installed. 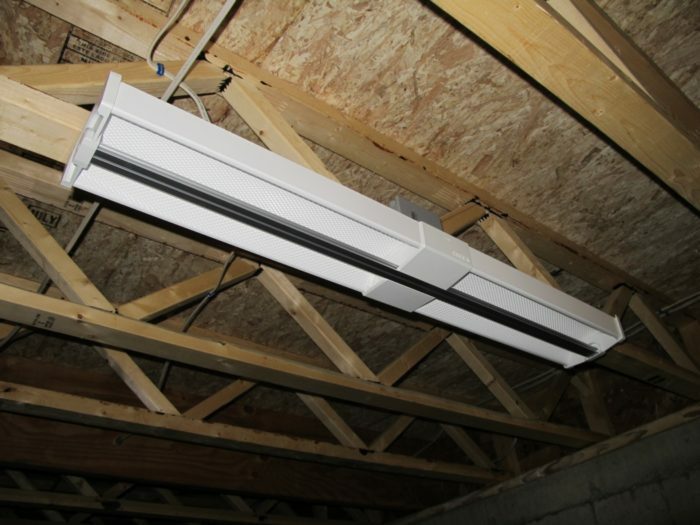 We used surface-mount Cree SL40 LED troffers in our basement. Here's the SL40 shown turned off. 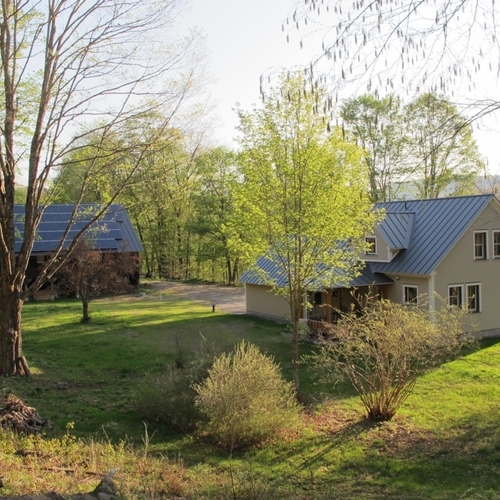 Our electrician was in last week installing lighting in our new home in Dummerston. Virtually all of our lighting will be LED, the state-of-the-art choice today for energy-efficient lighting. LED stands for “light-emitting diode.” It’s a solid-state lighting technology that converts electric current directly into visible light. LED lighting has far higher efficacy (the number of lumens of light output per watt of electricity consumed) than incandescent lighting — which converts roughly 90% of the electric current into heat; only 10% into light. Most LED lights also have modestly higher efficacy than compact fluorescent lamps (CFLs). The recessed LED lights we installed have an efficacy of 66 lumens per watt, which is not too different from that of CFLs, but LEDs are much more directional than CFLs, so they work better in recessed cans in delivering usable light to where you need it. Very significantly, LEDs are also better for the environment and human health than fluorescent lamps. With fluorescent lamps (both linear and compact), an arc of electricity passes through mercury vapor, which produces ultraviolet (UV) light; that UV is then turned into white light using a phosphor coating on the inside of the fluorescent tube. Any time a fluorescent lamp breaks, a small amount of elemental mercury escapes into the building; the mercury also gets into the waste stream unless the lamps are properly recycled. While the elemental form of mercury is far less dangerous than compounds in which the mercury is bonded to carbon-based organic compounds, there is still risk. Mercury is also needed in the metal halide and high-pressure sodium lamps that are common along highways. The other advantage of LED lights is the expected life — typically 25,000 to 50,000 hours, which is far longer than the 1,000 to 3,000-hour life of incandescent light bulbs and somewhat longer than most CFLs and linear fluorescents (10,000 hours for the former, 15,000 hours for the latter). I won’t quite believe the long-life claims for a few years, though; I’ve installed a number of early LED lights that had premature failures after less than a year. There are lots of LED lights on the market — and more appearing all the time. 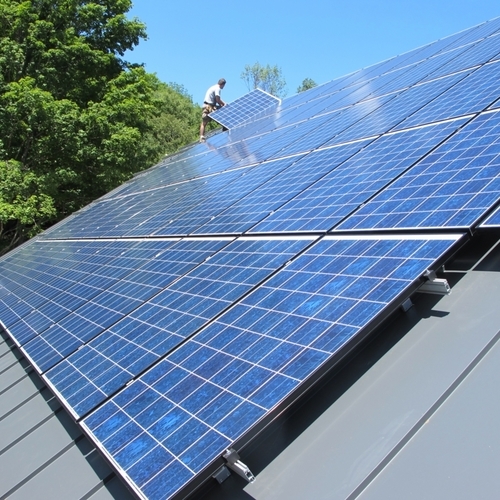 The products we installed are made by an American company, Cree, which is based in North Carolina and continues to be one of the world’s top innovators with LED technology. I first became familiar with Cree in 2007 when our company, BuildingGreen, recognized a breakthrough downlight product from LED Lighting Fixtures (LLF), as one of our Top-10 Green Building Products of the year. 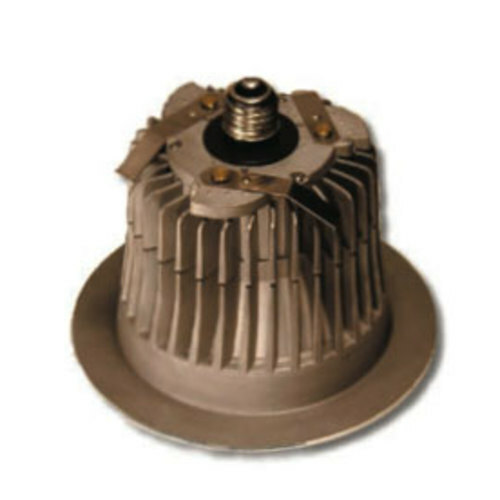 LLF incorporated LEDs made by Cree into their downlights, which set the bar for light quality from LEDs, and really established LED technology as a viable high-quality light source. Shortly after that, Cree acquired LLF and entered the light fixture business — in addition to being a supplier of LEDs to fixture manufacturers. 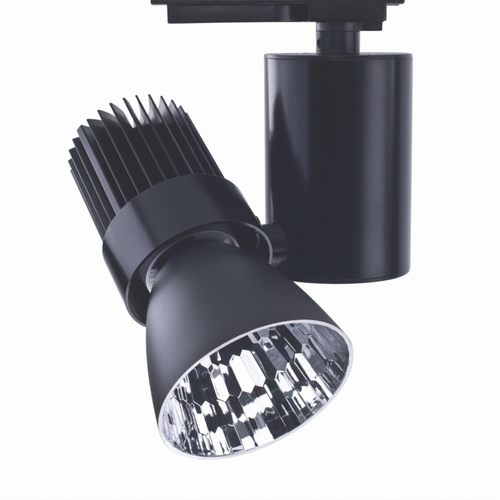 Ongoing product innovation and a key company acquisition in 2011 of Ruud Lighting and their subsidiary company BetaLED, which has been the technology leader with outdoor LED lighting, has kept Cree at the front of the pack in the LED world. 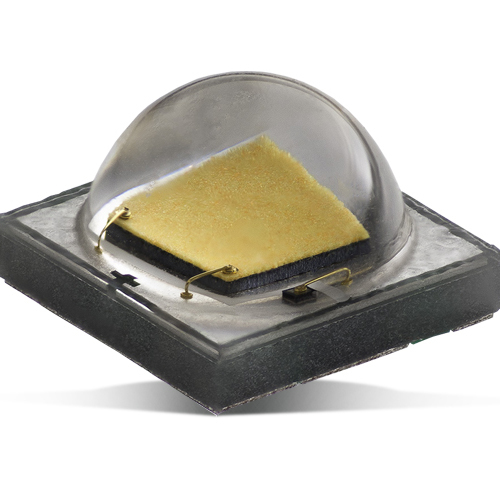 The actual LEDs used in Cree lights are made in the U.S., though most if not all of the company’s fixtures are now produced elsewhere — no doubt to reduce costs and stay competitive. 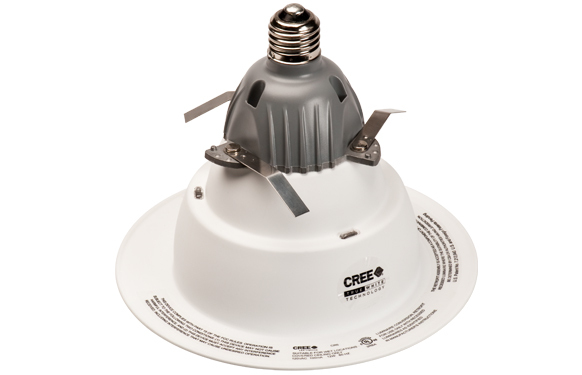 We will have three types of Cree LED lights in our house: CR6 downlights installed in recessed cans in our ceilings; SL40 linear LED lighting fixtures for our garage and basement; and the new LED light bulbs that were introduced this year. 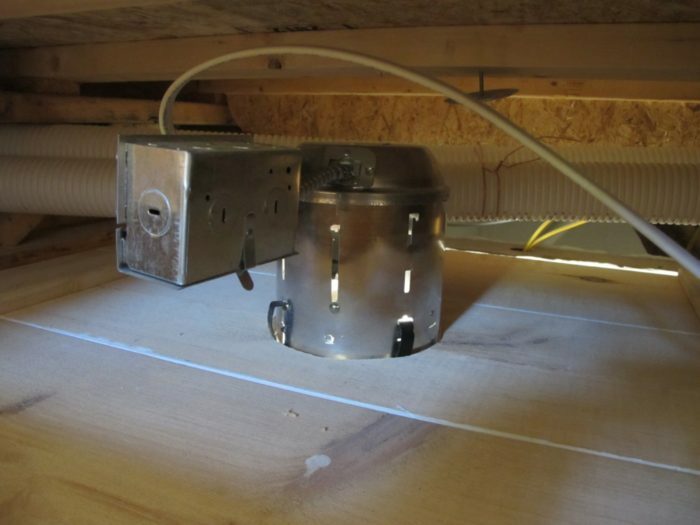 The latter will be installed in light fixtures that can accept incandescent light bulbs, and those have not been installed yet. But the downlights and surface-mount fixtures are in place and working beautifully. The CR6 downlights are designed as retrofit lamps for six-inch recessed cans with Edison sockets that accept standard screw-base incandescent (including halogen) lamps. Cree also makes a version for the GU24 base, which is required for Title 24 compliance in California (because that type of lamp can’t be swapped for a less-efficient incandescent light bulb). The CR6 lamps we installed use 9.5 watts to produce 625 lumens, which works out to just under 66 lumens per watt (lpw), though the Cree literature lists the efficacy as 61 lpw. This lamp is available in different color-temperatures. We opted for warm-white light with a color temperature of 2700K (lamps with cooler, whiter light, at 3000K, 3500K, and 4000K, are also available). In terms of light quality, the CR6 has an excellent color rending index (CEI) of 90. While we’re not living in the house yet, the light quality seems much like that of incandescent lighting that most people prefer in homes. The Surface Linear, SL40, fixtures we installed function much like standard fluorescent fixtures that mount on a ceiling, but they’re more elegant and use LED technology. Ours are 40 inches long and consume 55 watts while producing 4,000 lumens (73 lpw). The light, with a color temperature of 3500K, is somewhat cooler than our CR6 recessed lights, but seems just fine for where we are using them. The light quality, with a CRI of 80, isn’t as high as that of the CR6, but it’s respectable — and comparable to most fluorescent lights. This year, Cree has been making news with LED light bulbs designed to replace standard incandescent and screw-in CFLs. In March, 2013 the company introduced 60-watt and 40-watt equivalent bulbs (using 9.5 and 6.0 watts, respectively, for the warm-white version). Delivering 800 lumens using just 9.5 watts, this lamp has an amazing efficacy of 84 lpw. A cool-white version has an efficacy of 89 lpw. While that lamp has a CRI of 80, just this month the company introduced a brand new TW (for True White) version with a remarkable CRI of 93. But in the soft-white (2700K) version, this lamp has an efficacy of only 59 lpw. To get the high light quality there is some sacrifice in efficacy. The most exciting thing about LED lighting today is that Cree isn’t the only innovator. There is intense competition by other companies, including Philips, which is driving the entire industry forward at a rapid pace. 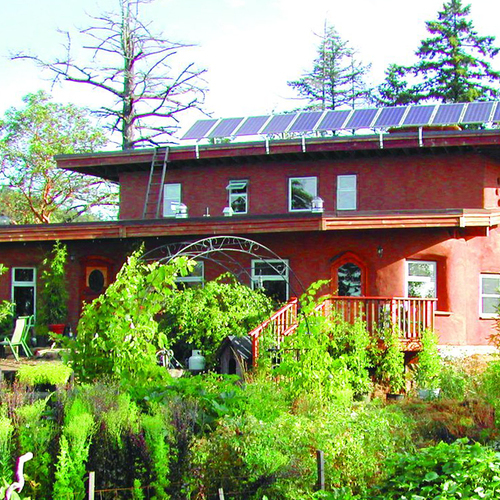 Light quality will keep improving while energy consumption will deep on dropping. I just put a few Lithonia LED cans in my ceiling and on dimmer switches. At under $50 for the whole kit, that's a pretty good deal. The light, at 3000k is nice. 2700 would be a bit nicer. Something to be aware of is that unlike incandescent, the light doesn't "warm" as it dims. Fluorescent technology isn't based on a mercury arc spectrum, but rather the ARGON spectrum, with just a bit of mercury. The mercury is added to the low-pressure argon to bring the strike voltage of the arc down to something reasonable. Most of the primary light is from the argon spectrum, though the mercury lines DO appear, of course. 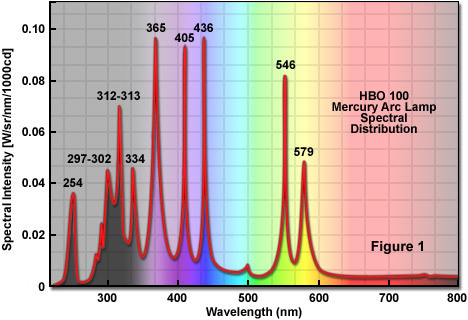 Yes the phosphors in "white" fluorescents are designed to convert that UV lines of the mercury to visible spectrum, as well as converting some of the visible blues of both the mercury & argon spectra to another visible color for color balance. But nearly all of the primary output energy of the un-coated fluorescent tube already in the visible spectrum- less than 20% being in the UV. Most CFLs have three main color outputs in the visible spectrum. Key to the phosphor design is to balance those three colors in such a way that colors aren't too distorted when viewed by humans. The color rendering index (CRI) of most $2 twistys are between 82-85, which isn't terrible, and comparable to the low end LED assemblies. Heat management is a serious design issue for LED assemblies, since both the center-color and the output intensity of the different individual LEDs in the assembly vary significantly with temperature, which affects both efficiency and color rendering, which is why higher-power units usually have expensive die cast aluminum heat sinks as part of the package. Putting LEDs in high-temperature locations WILL reduce their efficiency & as-used color rendering as well as their lifespan, but inside of reasonably conditioned space they'll do pretty well. Thanks for this detail on lighting. 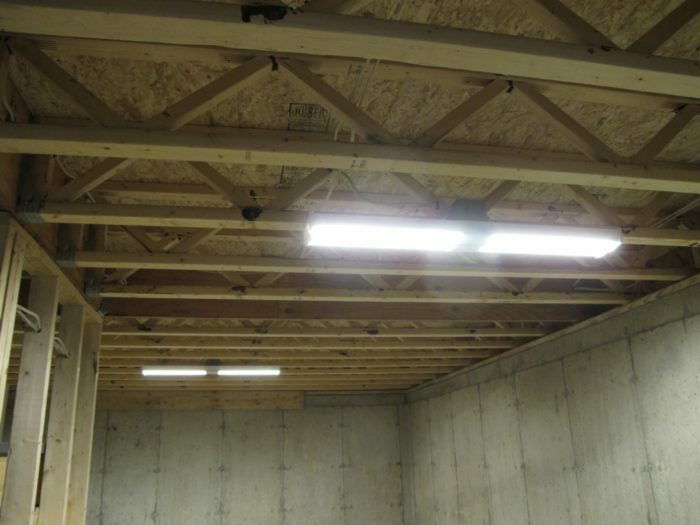 I realize that I've misunderstood some key aspects of fluorescent lighting for many years. ...it looks like the LED lighting prices wars are heating up! It was only a matter of time before the combination of CFL (or better ) efficiency and better ruggedness and lower environmental footprint pushed LEDs to center-stage. At recent price points it's safe to say we're "there". Three to five years ago I was advising people to install CFLs rather than LED$, stating by the time the CFLs failed, LED pricing would have crashed, along with a strong uptick in luminous efficiency and color rending. ( I guess I got lucky this time, eh" ;-) ) The low-end dimable Cree A-bulbs have comparable or better color rendering, higher efficiency and 3-4x the rated lifespan of a $2 twisty CFL, and they ENTERED the market at sub-$10. The 60W-equivalent 800 lumen Cree is 84 lumens/watt, CRI greater than 80, and price at $8 in the local box store, and rated for 23 years @ 3 hours/day usage. The Philips L-Prize winner is the real deal, with CRI = 90+ is more efficient ( 94lumens/watt ) but still commands a street price of $25 from web discounters. As an existence proof that it's possible to build units that good makes me believe the standard offerings from all vendors will match or exceed that by 2020, at a price point lower than the currently $8 Cree. But because they last SO long, they can be though of as a capital expenditure, not a replacement part the way incandescent bulbs have long been viewed. 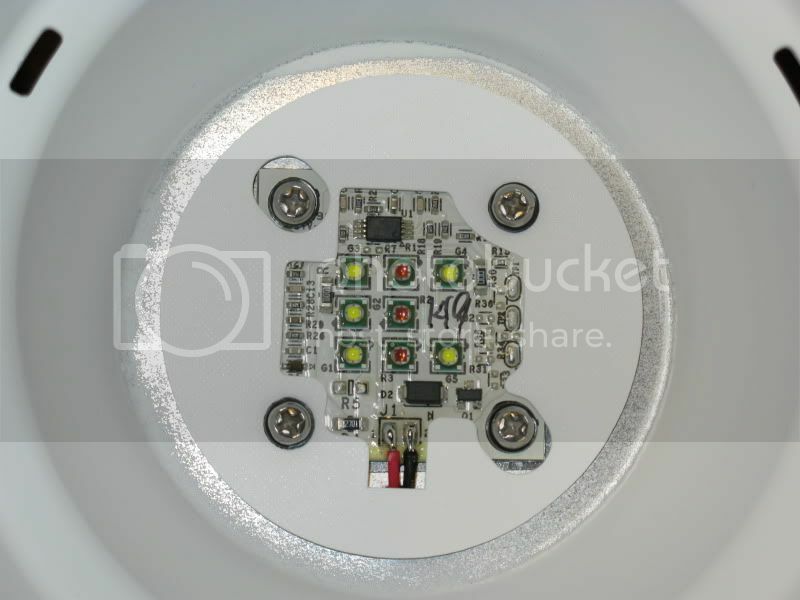 Once a socket is populated with an LED assembly, it will likely stay there for decades. Linear fluorescent technology isn't completely dead (yet), with slightly higher efficiency than most LED versions, but by the time the electronic ballasts give up the LED fixtures will be both cheaper and more efficient. It's only a matter of time. I heard that Philips is no longer producing the top-efficacy L Price lamp that they developed, instead focusing on the lower-cost, lower-efficacy product. I'd like to find out that that isn't the case. Have you heard anything about that? The fact that the L-prize bulb can't be built profitably at the L-prize mandated price point after X-years Philips may have opted to give the million bucks in prize money back and not produce it rather than sell millions of them at a loss. The original prize requirements stipulated an entry price of no more than $X, dropping to $Y within 3 years, and $Z within 5 years. Their yields that actually meet spec may not (yet) be high enough to retail at $Y without going broke. 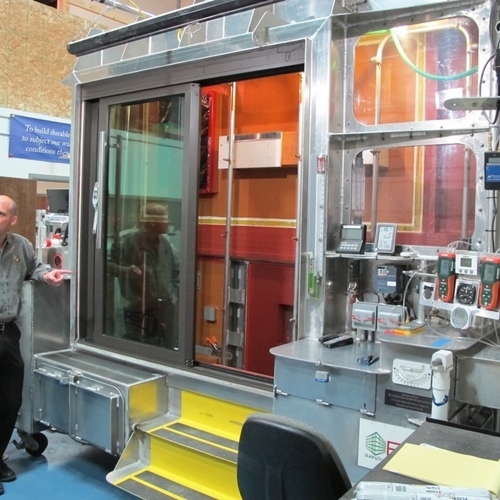 I'm sure they can crank out only slightly lower efficiency and somewhat lower CRI units at high volume with enough margin to compete on price, and they DO need to stay in the biz making money to keep the industry going. Until/unless the marketplace demands VERY high CRI, comparable efficiency will be met (eventually) at a much lower price point. The $8 Crees are are already there. But the fact that the fundamental technology hurdle has been met, the cost hurdle is only a matter of time, and it could very well be that a CRI of 85 instead of 90+ is more than acceptable to the majority, as seems to be the case with fluorescent technology, in which case 90+ is still available to the art-display color-purists at one price point, while the rest of us live fat & happy with our cheaper LEDs that look pretty good. 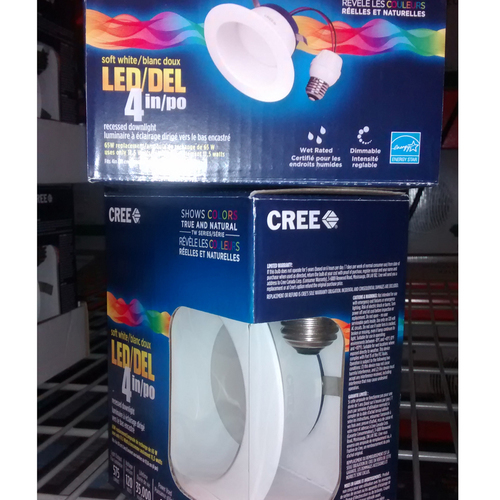 The (current-price) $8 Crees really ARE pretty good, at almost the same luminous efficiency as the L-prize bulb (and higher than CFL technology) and a CRI comparable standard CFL offerings. Philips and others are in a serious price-war for the middle part of the market, which I see as higher-than CFL efficiency & longevity at a comparable mid-80s CRI. Several very good comments on this topic. But lost in the love affair with LED lighting is the necessary efficacy comparison to linear fluorescent. T5 lamps can produce over 100 lumens/watt with rated life of 40,000 hours. In addition, programmed start ballasts (all T5's are this) reduce the premature failure of lamps due to the frequent on/off cycles that often kill CFLs. That being said, I am a big fan of high quality LED lighting fixtures and have many in my home - Home Depot sells a version of the CR6 by CREE. I have been involved with CREE and Beta LED on several projects (the author incorrectly cited Rudd instead of RUUD lighting).There are several manufacturers producing high quality, well-engineered fixtures. But the reputation of LED lighting has been significantly set back by cheap, off-shore knock-offs with inferior chips and NO thermal management. We need to stop making direct comparisons to our old A-lamps and embrace the strengths of LED instead of saying "It doesn't look the same". Thanks for catching our typo ("Ruud" was misspelled). I have corrected the error. I recently completed a whole-house renovation, which included replacing all of the existing incandescent bulbs with the CR6 and CR4 fixtures (more precisely, the Home Depot versions). The retrofit application of these fixtures, along with the integrated trim ring and low energy use all add up to great products. The HD versions use the CREE LEDs in them, so for about $10 to $15 cheaper you can the same light, but slightly less rated lifespan. So far I’m impressed with the CRI and the light output for only 9.5 watts. As was mentioned before, the light does go a little more “greenish” as they dim down, but not terrible. I also installed the new CREE A-bulbs in several locations and am as equally impressed. Not having all of that excess heat put into the house on hot summer days here in Phoenix is a plus.